Human immunodeficiency virus (HIV), a retrovirus, was discovered independently by Luc Montagnier and Robert Gallo in 1983. As per the WHO report of 2015, globally, around 40 million people are infected with this virus. HIV is an enveloped virus and contains two copies of single-stranded RNA (ssRNA) as the genetic material. Apart from the genome, the infectious virus particle also carries enzymes namely reverse transcriptase (RT) and integrase which aids in the integration of viral genome with the host (e.g. human) genome. The initial target cells for this virus are macrophages and T4 lymphocytes (immune cells). In the process of viral replication, the virus kills or impairs these immune cells. In untreated patients or patients who does not respond to the treatment, HIV infection leads to acquired immune deficiency syndrome (AIDS). As a result of lack of immunity, HIV-infected patients die from complications of secondary infections. The virus spreads from infected individuals to healthy individuals through sexual contacts, blood and blood-related products and from mother to newborns. Until now, there is no complete cure for HIV infection nor there is any vaccine for prevention. Fig. 1. Overview of our method. In absence of any HIV-RT inhibitor (drug), RT uses the RNA template and the DNA primer and does the complete extension of the template yielding long DNA-RNA hybrid. In presence of HIV-RT inhibitor (e.g. AZT-TP), the complete extension of the RNA template is not possible. SYBR Green II dye binds to the DNA-RNA hybrid and exhibits enhanced fluorescence. The amount of fluorescence and the time taken to reach certain fluorescence threshold differs based on presence or absence of inhibitor and also based on the concentrations of the inhibitor. Using simple mathematical formula, the fluorescence data is then converted to enzyme activity (%). The concentration of inhibitor at which RT has only 50 % of activity is considered the IC50 for that particular inhibitor. Before the discovery of the retroviruses, scientists believed that flow of biological information always had the following order: DNA (deoxyribonucleic acid) → mRNA (messenger ribonucleic acid) → protein. This was called the central dogma of life in molecular biology. The unique ability of RT from retroviruses is that it can use RNA as template and can make DNA back. RT converts HIV’s genomic RNA into dsDNA (double-stranded DNA), which later with the help of the enzyme integrase gets integrated into the human genome. These conversion and integration steps are really crucial for the establishment of HIV infection in humans. So, scientists started developing drugs that can kill the function of reverse transcriptase, apart from developing drugs against integrase and protease. With the use of RT inhibitors as monotherapy or in a certain combination with protease and integrase inhibitors, HIV variants could evolve that resist these drugs. Apart from error-prone HIV-RT, a considerable part of the emergence of resistance variants is also due to misuse or improper uptake of drugs. These resistant variants were also documented in HIV patients who were never exposed to these drugs. These scenarios advocate for the phenotypic and genotypic characterization of HIV variants found in patients before the start of the treatment. To study inhibition by inhibitors or their resistance, scientists have to utilize very expensive and time-consuming methods. Some of these methods also utilize radioactive materials, which come with disposing problems. 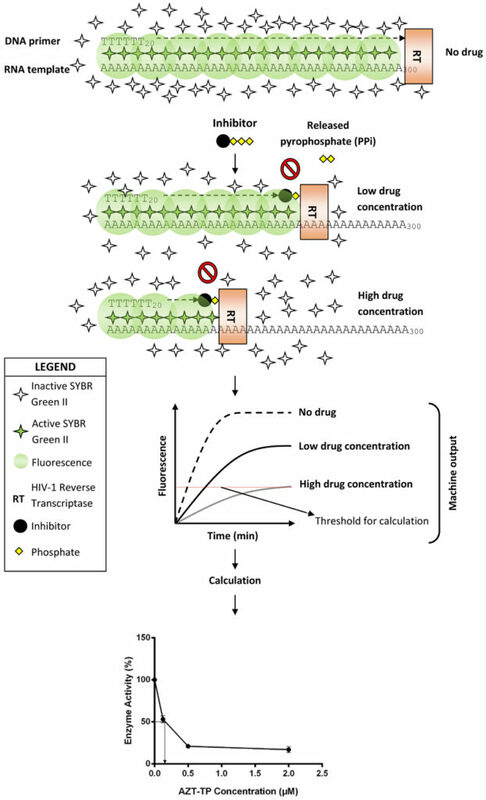 For screening libraries of compounds against HIV-RT or resistant HIV-RT, there is a demand for high-throughput, quick and inexpensive methods. In our study, we have used a commercially available and affordable dye (i.e. SYBR Green II), which is generally used to visualize RNA in agarose gels in the laboratory, to measure i) RT activity ii) inhibition by inhibitors and iii) drug resistance. Figure 1 shows the overview of our method. The reaction mixture contains single-stranded RNA template, DNA primer, a single type of deoxyribonucleotide and buffer, apart from SYBR Green II. RT, at ambient temperature and magnesium ion concentration, uses the template-primer pair, does an extension and makes a long DNA-RNA hybrid. We found that SYBR Green II binds to this hybrid and exhibits enhanced fluorescence compared to the background. The amount of fluorescence and time taken to reach certain fluorescence threshold depends on RT enzyme activity (bottleneck). The fluorescence was measured using a simple real-time PCR machine. By using a mathematical formula, we converted the fluorescence data to enzyme activity and determined the inhibitory concentration (IC50) for inhibitors. Figure 1 shows the enzyme activity of HIV-RT wild type in presence of different concentrations of AZT-TP (a well known HIV-RT inhibitor). Unlike other methods, by using our method one can expect the data in less than 2 hours. SYBR Green II Dye-Based Real-Time Assay for Measuring Inhibitor Activity Against HIV-1 Reverse Transcriptase.